SACRAMENTO, Calif., Dec. 4, 2018 /PRNewswire/ -- The United States Department of Commerce Minority Business Development Agency (MBDA) named global life sciences corporation Anpac Bio-Medical Science Company, the 2018 "Minority Health Products and Services Firm of the Year" (MHFY). Recognized as the, "Minority-owned firm that has improved the quality and delivery of healthcare through innovation," MBDA honored Anpac Bio during the 2018 National Minority Enterprise Development (NMED) Week at the National Minority Supplier Development Council Conference in Austin, Texas. 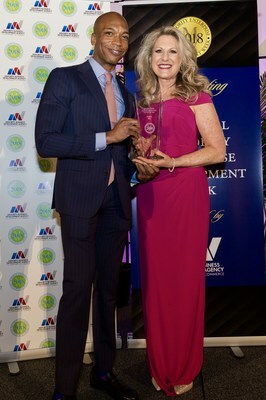 The award was presented by MBDA National Director Henry Childs, II to Anpac Bio Chief Marketing Officer Drisha Leggitt, accepting on behalf of Anpac Bio Chief Executive Officer Dr. Chris Yu and the Anpac Bio worldwide team. "We honor exceptional minority business enterprises (MBEs), their leaders, and the important role in maintaining a strong and healthy American economy," said MBDA National Director Henry Childs, II. "I am honored to recognize the 2018 National MED Week award winners who excel in business and entrepreneurship. Their stories and successes are an inspiration for all Americans. MBDA congratulates Anpac Bio-Medical Science Company for being named the 2018 'Minority Health Products and Services Firm of the Year'!" The National Minority Business Awards are the highest level of national recognition a minority-owned firm can receive from the United States Department of Commerce. These prestigious awards celebrate the outstanding achievements of minority entrepreneurs, as well as the individuals and organizations that have demonstrated their commitment to advancing MBEs. Acknowledging the corporation for executing significant and consistent innovation through its worldwide technology and services, Anpac Bio was particularly referenced as the national MHFY winner due the company's multiple-award winning, "Cancer Differentiation Analysis" (CDA) liquid biopsy technology. Described as "game changing", and receiving the, "Breakthrough Innovation Award", at the World Nobel Prize Laureate Summit; and named, "Most Promising Cancer Screening Company", at the 2017 Global Precision Medicine Industry Awards, Anpac Bio's CDA reinvents early, multiple-cancer screening. By analyzing simple, standard, blood tests, and applying Anpac Bio's proprietary, multi-level, multi-parameter, diagnostic algorithms, Anpac Bio's CDA liquid biopsy devices identify cancer with measurably-greater accuracy than most current, conventional screening methods. And it does so without any harmful side effects in patients; generating far fewer "false positives"; at a cost substantially lower than traditional testing; and generating results within minutes of submission. Comprehensive research validity data from 120,000+ cases, and independently-corroborated by world-renowned hospitals and cancer research leaders, demonstrate Anpac Bio's CDA diagnostics consistently detect 28+ cancers -- with sensitivity and specificity rate ranges of 75%-90%. Anpac Bio is the only company fully-commercialized and generating liquid biopsy screening revenue globally; with 101+ CDA-related patents issued to date (250+ filed) worldwide. Anpac Bio joins other prestigious, national/international 2018 MBDA award-winners, including: Coca Cola Company; MBE Capital Partners, LLC; Champion Controls, Inc.; McWong Environmental Technology; DAP Construction Management, LLC; Resource Management, Inc.; Sensis; IMR Development Corporation; and other exceptional individual award winners. Also in attendance and celebrating their commitment to purchasing/supporting Minority Business Enterprises included: Merck, Facebook, Inc., Target Corporation, AstraZeneca Group, General Mills, Anthem Blue Cross, Toyota, IBM, Dell, Wells Fargo, Eli Lilly & Company, Pricewaterhouse Coopers, CVS Health, and the Walt Disney Company, among others. 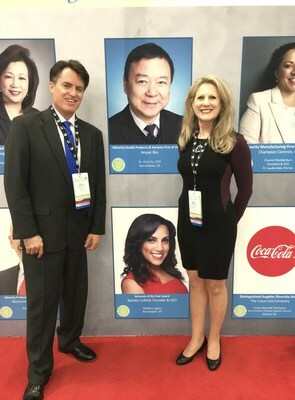 "Anpac Bio is very honored that the United States Department of Commerce has named our company the 2018 national, 'Health Products and Services Firm of the Year'," states Anpac Bio CEO Chris Yu. "We are so appreciative our CDA liquid biopsy technology is considered the most innovative in the country. And we're particularly proud to provide cost-effective and consistently-reliable, liquid biopsy cancer screening globally; especially for minority and socio-economically challenged populations that are typically underserved by standard cancer prevention and early detection options."